Before connecting to VoiceBoxer or if you are experiencing any issue during an event, you can check your settings at our check page. If you get all green marks, you can check that your audio and video settings are ok. Once you click on “Check your audio and video settings” follow the instructions. 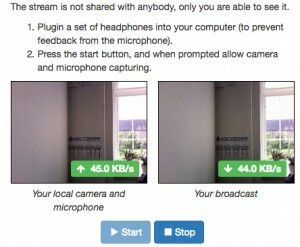 You will be asked to “allow the use of your camera and microphone” (Chrome) or “share your microphone and camera” (Firefox) in order to check your settings. Once allowed, you will be able to press on Start. If you can see and hear yourself you’re good to go! After you click on “Check your audio and video settings” you’ll be able to play a short video by clicking on Start. If you can see and hear the video, you’re good to go! Browser Your current browser does not support the required features for VoiceBoxer to function correctly. We recommend downloading the newest version of Google Chrome or Mozilla Firefox. If you’re a presenter or an interpreter you must use Google Chrome or Mozilla Firefox. If you’re an audience member you can use other browsers, though we recommend Chrome or Firefox. Cookies Cookies are disabled in your current browser. You should allow your cookies for the best experience of VoiceBoxer. Video Playback Your current browser does not support the required features for VoiceBoxer to function correctly. We recommend downloading the newest version of Google Chrome or Firefox. If you must use Google Chrome or Mozilla Firefox. 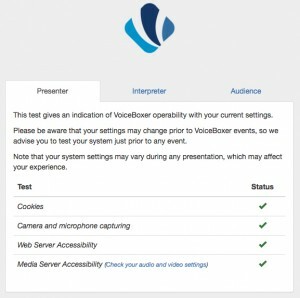 Web Server Accessibility Your computer is not able to connect to the VoiceBoxer web servers. Please check your firewall settings with your IT department. Please visit our article on Optimal Firewall Configuration to learn how to solve this issue. Media Server Accessibility Your computer is not able to connect to the VoiceBoxer media servers. Please check your firewall settings with your IT department. Please visit our article on Optimal Firewall Configuration to learn how to solve this issue.